A classic baked stuffed pasta dish with a creamy filling made with Campbells® Healthy Request® Condensed Cream of Chicken Soup, tender chicken, artichokes, spinach, and onions. Topped with Prego® No Salt Added Pasta Sauce and baked to perfection. manicotti shells	 26 oz. 48 ea. 1. Cook manicotti according to package directions. Cool. Reserve. 1. In large sauté pan heat canola oil over high heat. 2. Add chicken. Cook for 5 minutes, stirring often to ensure chicken crumbles. Reserve. 1. 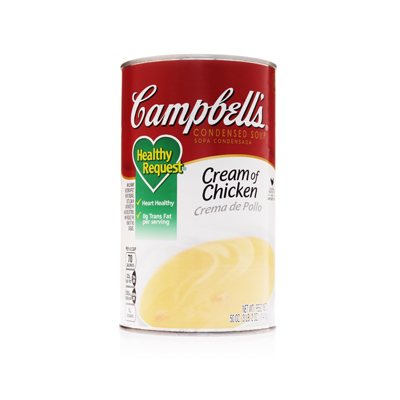 In a large bowl, combine Campbells® Healthy Request® Cream of Chicken Soup, reserved chicken, artichokes, 1/2 of the listed amount of mozzarella, onions, black pepper, ricotta cheese and eggs. Mix well. Reserve. 1. In a large pot bring 2 gallons of water to a boil. Blanch kale for 15 seconds. Strain. Add to soup mixture. Mix well. 1. Place soup mixture in a pastry bag. Pipe roughly 2.25 ounces of mixture into each pasta tub. Repeat until pasta tubes are finished. 2. 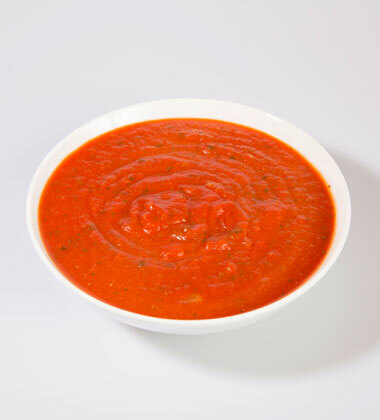 Using a 12-ounce ladle, spread 1-1/2 cups of Prego® No Salt Added Sauce on the bottom of two hotel pans. 3. Place filled pasta on top of the sauce. Repeat until 24 are in each pan. 4. Using a 12-ounce ladle, spread 1-1/2 cups sauce over top of the pasta in each pan. Bake for 30 minutes in a preheated 325°F oven. 5. Top with remaining cheese. Bake for additional 3 minutes. 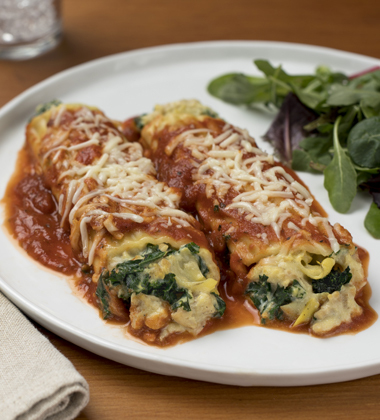 To Serve: Portion 2 filled cannelloni onto serving plate. Serve immediately. this recipe requires 2 pounds raw chicken, cooked and crumbled.